Jan Weenix’s Still Life with Hunting Trophies and Jan Davidsz de Heem’s Still Life with a Pewter Jug, Oysters, and a Lemon are both paintings that were influenced by the Dutch Golden Age, which took place throughout the span of the 17th century. The Netherlands dominated trade between European countries at this time, and because of this monopoly, the Dutch were able to access foods that were considered exotic (“Albany Institute of History and Art”). Also, the exponential increase in trade-based wealth complicated the differentiation between the aristocrats and the lower classes. A rise in hunting and importing began to influence the lives of the Dutch, from their everyday lives to the paintings produced in this era. There are visual parallels between these two particular paintings that I will be discussing in this essay: in both paintings, there is an evident struggle toward exoticism being depicted. 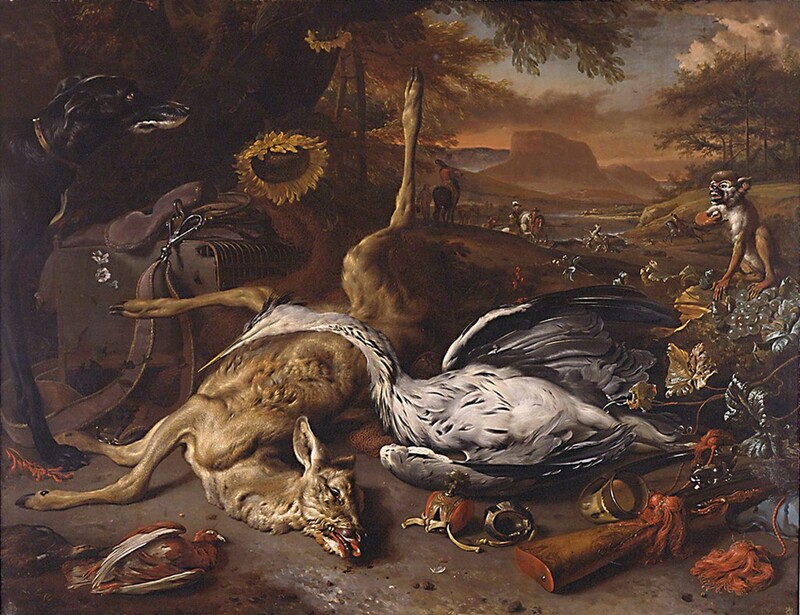 Jan Weenix’s hunting trophies reflect the end of the Dutch Golden Age, the 1680s-1690s, in which the struggle toward pride and status became more frantic and gruesome; however, the quiet subject matter of Heem’s piece depicts a tamer exoticism. In Heem’s painting, we see lemons and oysters highlighted, whereas in Jan Weenix’s Still Life with Hunting Trophies the focus is on slaughtered animals. The lemon rind in Pewter Jug, Oysters, and a Lemon drapes over the jug, just as the heron’s neck drapes over the deer in Weenix’s painting. Each painting depicts these interdependent struggles between status and exoticism, and finally solidifies their relation with the simple concept of pride and the assertion of power through the feast. At this time in the 17th century, social status in the Netherlands was largely based on income. The lines between social classes were blurred, for there was mobility between social classes. One’s status depended upon wealth, and because the economy was blossoming during this time many people across different classes were acquiring wealth. Because they were no longer financially superior, Aristocrats had to identify themselves in new ways (other than sheer wealth). They turned to hunting to differentiate from the rising middle class, for they could hunt for sport rather than necessity. An appreciation for hunting trophies arose, hence the rise of still life paintings which depict hunting trophies. Paintings with historical and religious subject matter were once popular forms of art. During this time, they gave way to the rise in still life paintings and landscapes (there is an interesting mix of both of these in Still Life with Hunting Trophies). The subject matter of these paintings do not reflect the rise in Dutch prosperity, but the pride aristocrats had in defining their social class through the glamorization of hunting trophies. One can clearly see this pride upon examining Weenix’s painting. First of all, a heron is draped over the deer, as if they have been arranged for this painting. It not only captures the kill that has happened, but celebrates it. Two birds in the far left corner have also been slain, but they sit in the shadows away from the prized game. Even the sunflowers face the quarry, which is not the typical behavior of the plant. Usually sunflowers face the sun, but in this painting they turn toward the quarry, as if the dead animals are the source of light. Another detail that reflects a favor toward exoticism can be seen in Still Life with Hunting Trophies. A monkey watches the scene joyfully, an animal that does not belong in the Netherlands. This symbolizes that the rest of the world, through trade, is coming to the Netherlands and also celebrating the glory of wealth and status. Another significant factor to be considered in Still Life with Hunting Trophies, concerns the means by which the animals were hunted and killed. The background of the piece depicts another deer being attacked by hunting dogs, while the aristocrats approach slowly. This shows the detachment these hunters had to the specific act of killing, although they were devoted to showing off the results of this kill. The animals are not hunted down for the sake of sustenance, but for the purpose of being trophies. Therefore, the hunt is not for physical survival, but for the survival of the aristocratic class. In Gustave Flaubert’s Madame Bovary (1856), readers can see an aspiration to reach a higher class, based on ambition and not actual survival. Emma seeks pleasure through the wealth in the Vaubyessard feast, and barely enjoys the luxurious food set before her (Chapter 8). She only wishes to “prolong the illusions of this luxurious life that she would soon have to give up”. To the Dutch, these hunting trophies have a rosy “complexion of wealth” similar to the guests at Vaubyessard (qtd. in Flaubert Chapter 8). However, in terms of actual sustenance the animals mean nearly nothing. The animals merely symbolize their current position in the upper class, and by painting a scene of the hunting trophies the wealthy were immortalizing their social status. Hunting was not the only means by which to obtain the feast – and pride – during the Dutch Golden Age. Gathering, or importing, was also a means to obtain the exotic and luxurious. 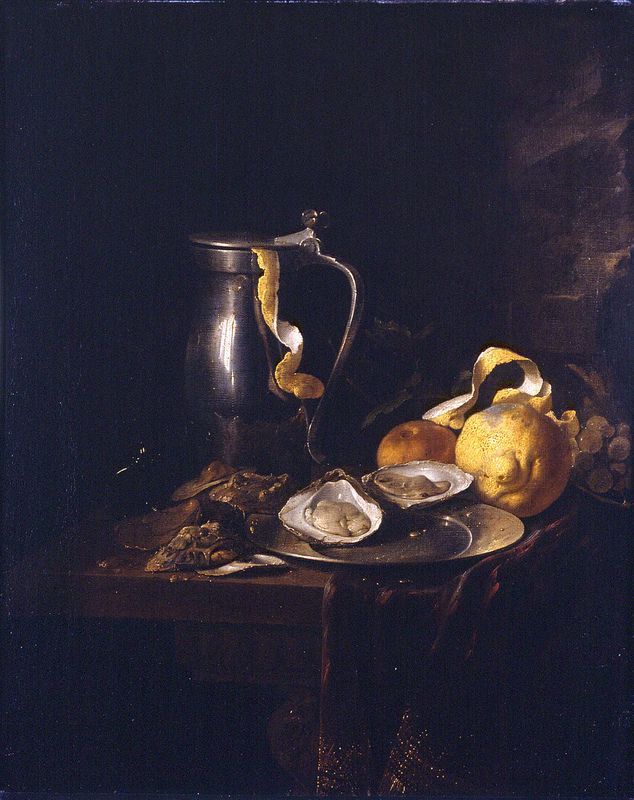 This is exemplified in Heem’s Still Life with a Pewter Jug, Oysters, and a Lemon. Lemons and oysters, the subjects of this painting, were not native to the Netherlands, and were therefore prized. The colors used in this painting are colder than those used in Weenix’s piece, which may say something about the difference between hunting and gathering to the Dutch. This painting relates to Gervaise’s struggle in L’Assammoir to obtain a new social class through the feast. For her wedding feast with Coupeau, meats and wines are purchased – but from stores, already prepared for the feast (Zola Chapter 3). Gathering was all that Gervaise was capable of doing, for she could not afford anything more at this time in her life. However, she aspired to prepare the next feast, her birthday feast, because it would make the feast more significant. This painting reflects the upwardly-aspiring Dutch middle class, who used commerce and trade to find their exotic feasts. In the painting, the pieces of the food that should be discarded, such as lemon rind and oyster shells, are used as decoration. The oysters are not cooked, but are to be served raw. Finally, the lemon and the oysters are obviously the central focus of the painting, while everything else fades into the background. This comparison of the paintings allows us to discover some interesting information about the feasts valued during different times in the Golden age. Neither of these paintings is actually about the sustenance being obtained, but the trophies found within the hunting or importing. To the Dutch, there is a pride in owning, or rather, wealth. The actual food gained from either source (animals or lemons) has no significance in the wide scheme of things; it is the way in which the sources were obtained. They are both trophies, meant to symbolize their social status, and by painting these the Dutch were able to immortalize that status. Flaubert, Gustave. Madame Bovary. 2nd ed. Norton, W. W. & Company, Inc. , 2004. Chapter 8. Print. Zola , Emile. The Drinking Den. Reprint. Penguin Group (USA), 2004. Chapter 3. Print.